The QAreaSeries class presents data in area charts. An area series is used to show quantitative data. It is based on a line series, in the way that the area between the boundary lines is emphasized with color. Since the area series is based on the line series, the QAreaSeries constructor needs a QLineSeries instance, which defines the upper boundary of the area. The area chart is drawn using the bottom of the plot area as the lower boundary by default. Instead of the bottom of the plot area, the lower boundary can be specified by another line. In that case, QAreaSeries should be initialized with two QLineSeries instances. Note: The terms upper and lower boundary can be misleading in cases where the value of the lower boundary is greater than that of the upper boundary. The main point is that the area between these two boundary lines will be filled. See the area chart example to learn how to create a simple area chart. This property holds the line (pen) color of the series. This is a convenience property for modifying the color of the pen. This property holds the fill (brush) color of the series. This is a convenience property for modifying the color of the brush. This property holds the lower one of the two line series used to define area series boundaries. Note: If QAreaSeries was constructed without a lowerSeries, this is null. This property holds the clipping for data point labels. True by default. The labels on the edge of the plot area are cut when clipping is enabled. This property holds the color used for data point labels. By default, the color is the color of the brush defined for labels in the theme. This property holds the format used for showing labels with series points. By default, the label format is set to @xPoint, @yPoint. The labels are shown on the plot area, whereas labels on the edge of the plot area are cut. If the points are close to each other, the labels may overlap. See also QAreaSeries::pointLabelsVisible, QAreaSeries::pointLabelsFont, and QAreaSeries::pointLabelsColor. This property holds the visibility of data point labels. False by default. See also QAreaSeries::pointLabelsFormat and QAreaSeries::pointLabelsClipping. This property holds the upper one of the two line series used to define area series boundaries. Constructs an area series object without an upper or a lower series with the parent object. Constructs an area series object that will be spanned between an upperSeries line and a lowerSeries line. If no lowerSeries is passed to the constructor, the x-axis is used as the lower bound instead. The QAreaSeries does not own the upper or lower series, but the ownership stays with the caller. 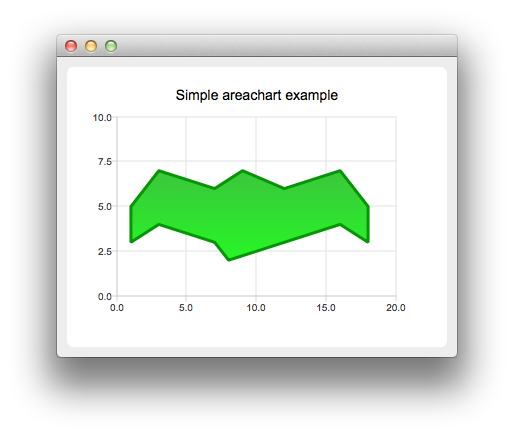 When the series object is added to QChartView or QChart, the instance ownership is transferred. Returns the brush used to draw the line for this series. This signal is emitted when the user triggers a press on point by clicking it in an area chart. See also pressed, released, and doubleClicked. This signal is emitted when the user triggers the first press in an area chart by doubleclicking point. See also pressed, released, and clicked. This signal is emitted when the user hovers the mouse cursor over a series or moves it away from the series. point shows the origin (coordinate) of the hover event. state is true when the cursor hovers over the series and turns false when it moves away from the series. Returns the pen used to draw the line for this series. This signal is emitted when the format of data point labels is changed. Returns whether the points are drawn for this series. This signal is emitted when the user presses the point specified by point in an area chart. See also clicked, released, and doubleClicked. This signal is emitted when the user releases a press that was triggered on point in an area chart. See also pressed, clicked, and doubleClicked. Sets the brush used for filling the area. Sets the series that is to be used as the area chart lower series. Sets the pen used for drawing the area outline. Determines whether data points are visible and should be drawn on the line. Sets the series that is to be used as the area chart upper series. If the upper series is null, the area chart is not drawn, even if it has a lower series.